I like this image. This is a guy, he’s been following the food pyramid, and this is kind of where you end up. 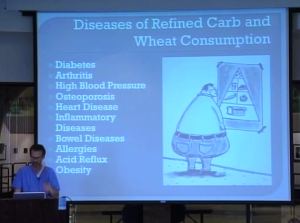 If you follow the food pyramid, it says you need 6-11 servings of breads and cereals, then you end up at that point and with the diseases of civilization. We’re going to go through these kind of one by one. First of all, let’s start with diabetes. Diabetes has increased 300% from 1980 until today. And the problem with diabetes is this, just like I was talking to a guy here and he said, “Oh yeah, the doctor told me I had pre-diabetes but he didn’t tell me what to do so that I didn’t have to take the pills.” And so when you’re at that pre-diabetes state you can just change your diet real easy and just avoid the pills altogether. If you’ve gone down the diabetes path where you’re taking insulin, then your pancreas eventually burns out. And when your pancreas burns out then your have to take some sort of medication. You have to take insulin. So what happens is, if you have diabetes, we start off with the diet. And the doctor recommends you go on a diet. The problem with the diet is this, it’s the American Diabetes Association diet, which is essentially high carb, low fat diet. Diabetes is a disease of carbohydrate metabolism. It means your body, when you have diabetes, you can’t handle carbohydrates.So why on earth be the first treatment be to put you on a high carb, low fat diet? The answer is they want to prevent heart disease. Diabetics can get heart disease. And they go, “Oh, if you get fat you’ll get heart disease.” And that has never been proven – the fact that fat causes heart disease. But from a medical perspective, it’s okay if you get diabetes because we have metformin and Actos and glitazones and insulin and long-acting insulin, and then eventually you have surgery and retina surgery, cataract surgery, etc. 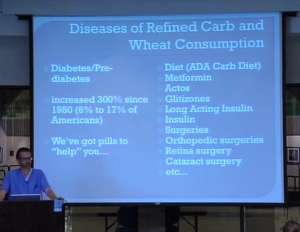 There are treatments for you, or you can just cut the killer carbs. There’s an analogy I thought of. Think of a drowning man. As long as the drowning man is being filled with water, he keeps drowning. Remove the water, and he’s no longer drowning – you’ve cured him. And it’s the same with diabetes. If you think of a person with diabetes, as long as that man is being filled with carbohydrates, which his body can’t process, that man will continue to have diabetes. You simply remove the carbs and the man no longer is diabetic – he is cured. You know you can debate whether you call it a cure or not. You say, “Well, it’s not a cure. If I still eat carbohydrates, I still have diabetes.” It’s just about having a choice – you can take the pills or you can change your diet. These are some of the diabetic “super foods,” as recommended by the American Diabetes Association on their website, I just checked it. They include whole grains, beans, sweet potatoes, fat-free milk and yogurt, which are carbs, carbs, carbs and carbs. They list other things, other low-carb stuff on there, too. But the point is, if I was diabetic and I ate a meal of whole gains, beans, sweet potatoes, fat-free milk and yogurt because they’re listed on the website as super foods, my sugar would be through the roof. And even if I wasn’t diabetic my sugar would be through the roof. So whether or not these foods are super, it depends on your perspective, right? Let’s say you’re a multinational drug company. And you make billions and billions of dollars every year by selling diabetes medications. Then these foods are super, right? That’s the best thing you could ever want a diabetic to eat. But if you’re a patient and you don’t want to take one or two or three diabetes medications the rest of your life, they’re not super. These foods to you are like water to a drowning man. In fact, on that same American Diabetes Association website, they recommend you count carbs. And they say a good place to start is to start eating 180 g of carbs per day. One of the reasons I got interested in this was my wife had gestational diabetes with our last two children. And it was just amazing. If she ate a healthy bran muffin from the grocery store, her sugar went through the roof. But when she ate meat and nuts and vegetables and as much as she wanted all day long, her sugar was just even kill. And so the question is, what’s more reasonable, 180 g of carbs a day or – this is William Osler, the Father of Modern Medicine, he recommended 9 g of carbs a day in 1901. Of course in 1901 they didn’t have medications to treat diabetes and they didn’t have insulin. But if you’re diabetic and you want to not take all the pills, you want to avoid the complications of diabetes, 9 g of carbohydrates a day is a much more reasonable thing than 180 g of carbohydrates a day. 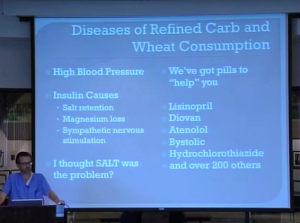 The next disease of refined carb consumption is high blood pressure. And basically the insulin itself is what causes the high blood pressure. You eat the carbohydrates, carbohydrates increase the insulin, the insulin increases your blood pressure – step by step by step. The insulin causes the kidneys to hold on to salt; the more salt you hold on to, the higher your blood pressure is. They also cause the kidneys to lose magnesium, and as you lose magnesium – magnesium is supposed to relax the blood vessels and relieve your blood pressure. So as you lose magnesium, boom: the blood pressure clamps down, the blood vessels clamp down. And insulin directly stimulates the sympathetic nervous system – it causes the fight or flight response. “But wait a minute, my doctor told me I had to cut the salt,” right? I don’t know if any of you heard that. If you cut the salt in your diet by half, you can expect your top number blood pressure, called systolic, you can expect it to go down by 4 points. Cut the salt in your diet by half, the top number of your blood pressure go down an average of 4 points. If you cut the refined carbohydrates out of your diet, the top number of your blood pressure can go down 20 points. So which one causes high blood pressure, is it salt or refined carbohydrates? It’s the refined carbohydrates. The idea that salt caused high blood pressure came because they studied the population that emigrated from an island where they ate a traditional diet to a basically Western civilization, and they asked the people who immigrated, they said, “Do you eat more salt than you used to?” And the answer was yes. They studied their diet, and their diet was yes, they ate more salt. That was the only question that they asked.